Description: This radar image from October 4, 1994, shows the east coast of central Florida, including the Cape Canaveral area. 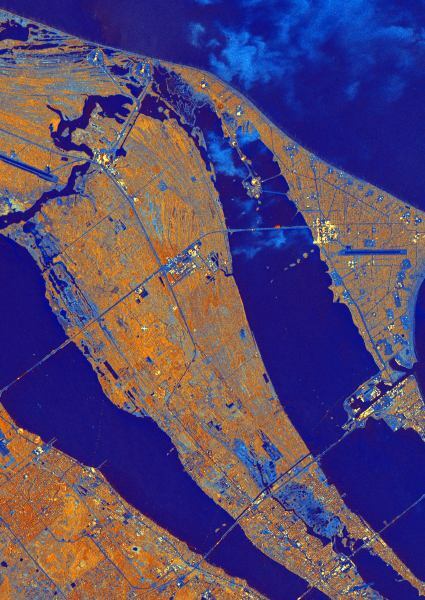 The Indian River, Banana River and the Atlantic Ocean are the three bodies of water (shown in deep blue) from the lower left to the upper right of this false color image. Parts of NASA's John F. Kennedy Space Center (KSC) and the Cape Canaveral Air Station (CCAS) are visible. KSC occupies much of Merritt Island in the center of the image, as well as, the northern part of Cape Canaveral along the right side of the image.